Well Cub fans, heeeeee’s heeerrrreee! 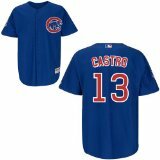 The Chicago Cubs called up rookie phenom Starlin Castro today to shore up their lacking infield defense and ideally provide some offense spark. The 20 year old Dominican native made a historical first impression by belting a 3-run home run in his first Major League at bat, and following that up with a bases-loaded 3-run triple on a 3-2 count in the bottom of the fifth inning. 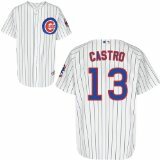 Thanks in part to Castro’s MLB record 6-RBIs in his debut, the Cubs beat the Reds 14-7. We’ll see what the future brings for young Starlin but so far he is in fact all that. 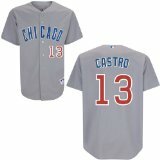 And surely his #13 Cubs jersey will be a hot commodity for Cub fans everywhere – and they are already available!